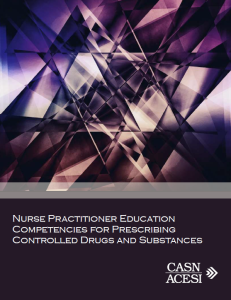 Nurse Practitioner Education Competencies for Prescribing Controlled Drugs and Substances - Canadian Association of Schools of Nursing / Association canadienne des écoles de sciences infirmières (CASN / ACESI). In 2015 the Canadian Association of Schools of Nursing (CASN) received funding from Health Canada’s Anti-Drug Strategy Initiatives program to carry out a project related to nurse practitioner (NP) education on prescribing controlled drugs and substances (CDS). The first part of the project was to develop a national, consensus-based framework of essential discipline-specific competencies for NP education on prescribing CDS in Canada. The purpose of the framework is to determine core content that all new NPs will need to have before prescribing CDS. Nurse practitioners provide essential care to people across health care settings. The competencies and indicators delineate the essential knowledge, attitudes, and skills all new NPs should possess related to prescribing CDS regardless of where they are employed following graduation. The ensuing competencies align with Canadian regulatory bodies’ entry-to-practice competencies for NPs that schools of nursing are required to integrate into program curricula. However, they are more detailed and specific in order to offer greater guidance to educators. In November 2012, Health Canada passed the New Classes of Practitioners Regulations which authorized NPs to prescribe controlled substances as outlined in Schedule I–Schedule V in the Controlled Drug and Substances Act (CDSA). NPs are authorized to prescribe all controlled drugs and substances described in the act, with the exception of heroin, cannabis, opium, coca and anabolic steroids (other than testosterone) (Canadian Nurse, 2013). “any type of drug that the federal government has categorized as having a higher-than average potential for abuse or addiction. Such drugs are divided into categories based on their potential for abuse or addiction. Controlled substances range from illegal street drugs to prescription medications”. While the federal government has allowed for this increased scope of practice, implementation across provincial and territorial regulatory bodies in Canada has varied. Currently, which controlled substances NPs are authorized to prescribe, and what additional education is required for practicing NPs to prescribe them, differs by province/territory.